Valentine’s Day is right around the corner and we hope you’re making big plans! Whether it’s dinner and a movie, or just a relaxing night at home, celebrating the day of love with the people you love is important. However, if you are experiencing urinary incontinence, or UI, the idea of sitting through dinner or a movie might sound scary to you. Frequent trips to the bathroom or leaking urine when you laugh or cough can make it difficult for anyone to enjoy a romantic evening. No one loves UI, and you are by no means alone in having one. Luckily, there are steps you can take to combat UI symptoms and claim your life back. 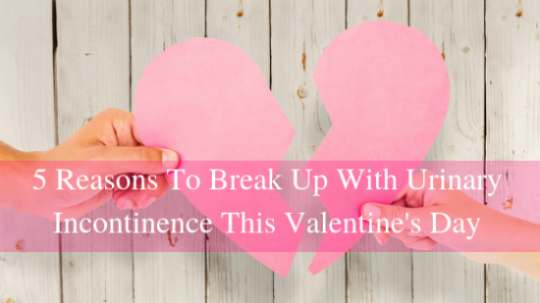 It’s time to break up with urinary incontinence and get your real relationships back on track. You Hate Your Urinary Incontinence–Can Anyone Blame You? Urinary incontinence is the involuntary leakage of urine, making a person urinate when they don’t want to. UI is the result of a person losing control over their urinary sphincter, due to it being lost or weakened. Urinary incontinence is more common in women than men, but it’s something that anyone can experience, especially as you age. Stress incontinence is when leaks are caused by pressure on the bladder due to coughing, sneezing, laughing, or exercising. Urge incontinence is having sudden, intense urges to urinate followed by the involuntary loss of urine. Overflow incontinence is the frequent and constant dribble of urine when the bladder doesn’t fully empty. Functional incontinence occurs due to physical or mental impairment. Mixed incontinence happens when you experience multiple types of urinary incontinence. Leaking urine during everyday activities, such as lifting, bending, coughing, or exercising. Feeling a sudden, strong urge to urinate right away. Leaking urine without any warning or urge. Being unable to reach a toilet in time. Wetting your bed during sleep. It’s easy to see why living with urinary incontinence is next to impossible. But who says it has to be this way? One thing is for certain, when you end this relationship you won’t be saying “it’s not you, it’s me”. UI can affect your quality of life in more ways than one. Many people who experience urinary incontinence may find themselves opting towards staying inside or canceling plans with friends. You may be embarrassed to go in social situations, or uncertain of what to tell people if they ask where you keep going. UI can also cause social anxiety, making you fear being out in public for extended periods of time or shy away from traveling to new places. Quick fix: There are plenty of products online that cater to women and men who experience UI. Leak-absorbing pads and underwear might provide more confidence and security in social atmospheres, allowing you to enjoy life again. Frequent trips to the bathroom are enough of an inconvenience during the day, and even more so at night. If you are visiting the bathroom multiple times during the night, you will probably notice you’re more tired during the day due to lack of sleep. Not getting a full night’s sleep can affect your concentration and immune system, leaving you more vulnerable to sickness. Quick fix: Watch your fluid intake and empty your bladder twice before going to bed. We suggest emptying your bladder once before getting ready for bed, and once before getting in bed. For extra peace of mind, consider investing in water-proof bedding. Since UI can make you leak urine unexpectedly, some might feel too embarrassed to be physically intimate or close to their partner. Quick fix: Monitor your fluid intake before partaking in sexual activities. For women, strengthening your pelvic muscles through kegel exercises could result in more control over your UI, and a more pleasurable sexual experience. When a person is living with UI, they know daily activities like exercising can result in unexpected leaks. Because of this, you might try to live a less-active lifestyle, or avoid the gym and sport-like activities altogether. Quick fix: If you’re planning to visit the gym, consider wearing darker clothing in case of leaks. Attempting to schedule your bathroom visits for every two to four hours could help you make it through your exercises, too. Employment and education might be one of the most important things urinary incontinence impacts. If you sit at a desk throughout the day, frequent trips to the bathroom may affect your concentration, and ultimately your job performance. You might also worry about what your co-workers or boss think about your time spent in the bathroom, causing you anxiety. If your job requires you to be present for extended periods of time (for example, a teacher or production worker), you might find it difficult to leave when you have the sudden urge to go to the bathroom. Quick fix: The best option would be to disclose your urinary incontinence with a trusted co-worker, or with your Human Resources department. However, if that makes you uncomfortable, try timing your bathroom breaks around classes or meetings. Drinking less coffee (caffeine) can help reduce the effects of incontinence, too. While these quick fixes may offer temporary relief, your best option is to talk to your urologist about treatment options. Just because you may experience urinary incontinence, doesn’t mean you have to live the rest of your life with it. For more in-depth details about these minimally-invasive treatment options, take a look at our treatments for female urinary incontinence. To learn more detailed information about male urinary incontinence treatments, click here. People can experience UI for multiple reasons, and symptoms and treatments will vary from person to person. If you’re ready to get back to life before UI, reach out to us. Our team of board-certified urologists are ready to help diagnose and treat your urinary incontinence. If you would like to learn more about the nutrition you should incorporate into your lifestyle for a healthy bladder, be sure to download your free copy of the Nutrition and Lifestyle Guide.